Ormiston Herman Academy – Super Sophia! Ormiston Herman Academy > News > Academy news > Super Sophia! Sophia has been extending her learning at home by exploring the world around her. She investigated natural materials that she found and has plans to find out how rocks are made. 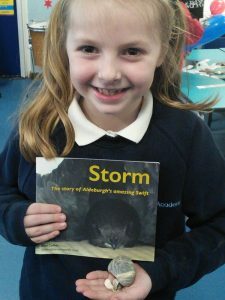 She has also been reading her own book about “Storm,” a swift who travels to Africa and has shared this in class.